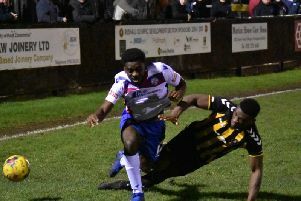 Having gone on a run of three games without a victory, the Steelmen were quickly into the stride and Joel Carta opened the scoring when he arrowed an effort into the bottom corner after 13 minutes. And that advantage was doubled just four minutes later when Steve Diggin laid the ball off and Crawford curled a superb strike into the corner. The struggling visitors gave themselves a lifeline eight minutes into the second half when Josh Pin’s cross was converted by Tyriq Hunte. But the Steelmen didn’t look back once Crawford had made it 3-1 when he converted Bradley Fortnam-Tomlinson’s cut-back. The big moment arrived with 13 minutes to go when Diggin was bundled over in the area and Crawford stepped up to complete his hat-trick from the penalty spot. Diggin got the goal he deserved to make it five when he nodded home Connor Kennedy’s cross. And not even a second goal of the afternoon from Hunte could take the gloss off a good afternoon for Steve Kinniburgh’s side. Kettering Town saw their lead at the top of the Evo-Stik League South Premier Division Central cut to eight points after Biggleswade Town completed the double over them with a 1-0 win. The Poppies struggled to get going all afternoon and Paul White was forced to make a fine stop from Solomon Nwabuokei inside the first minute. Biggleswade scored what proved to be the winner four minutes before the break when Paul White could only palm a Kieran Forbes shot into the path of Joe White who slotted home. The Poppies did have the ball in the net only to see it ruled out by an offside flag. And they were unable to find an equaliser after the break with Marcus Kelly shooting into the side-netting on the hour while Dan Holman went close with a dipping shot after a good run. With second-placed Stourbridge picking up a 4-1 victory over Redditch United, it means Kettering’s advantage was cut to eight points with seven games remaining.